“Roosevelt bit me and I went mad,” William Allen White said of his first encounter with Teddy in 1897. He grudgingly praised Franklin D. Roosevelt’s performance at the 1943 Casablanca Conference with, “We who hate your gaudy guts salute you.” Editor of the Emporia (Kansas) Gazette, the Sage of Emporia is known for his quips, quotations, and a sharply crafted view from Main Street expressed in his 1896 essay, “What’s the Matter with Kansas?” But for all his carefully cultivated small-town sagacity, William Allen White (1868–1944) was a public figure and political operator on a grand scale. Writing the first biography in a half-century to look at this side of White’s character and career, Charles Delgadillo brings to life a leading light of a once-widespread liberal Republican movement that has largely become extinct. White built his reputation as the voice of the midwestern middle class through his nationally syndicated articles and editorials. Crusader for Democracy takes us behind the veneer of the small-town newspaperman to show us the sophisticated, well-traveled man of the world who rubbed elbows with local, state, and national politicians, world-renowned journalists and authors, political activists of all kinds, and every president from William McKinley to FDR. Paradoxically, White, the master of insider politics, was also an insurgent who fought a fifty-year crusade for liberal reform, usually through and sometimes against the Republican Party. 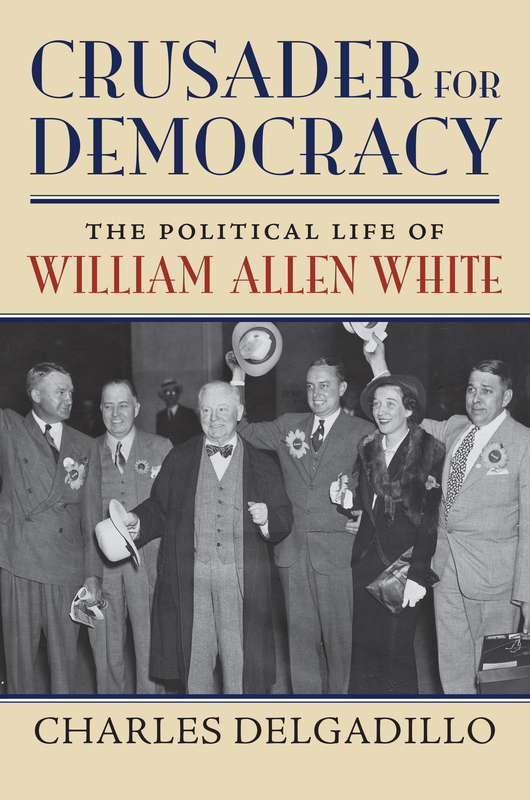 Delgadillo’s vivid portrait gives readers a behind-the-scenes view of the twentieth-century political and economic order in the making, with William Allen White firmly in the middle, deploying the soft power of friendship and influence to advance the cause of the common man and the promise of equal opportunity as the very foundation of American democracy. Charles Delgadillo is a lecturer in history at the California State Polytechnic University, Pomona, and Norco College, in California.